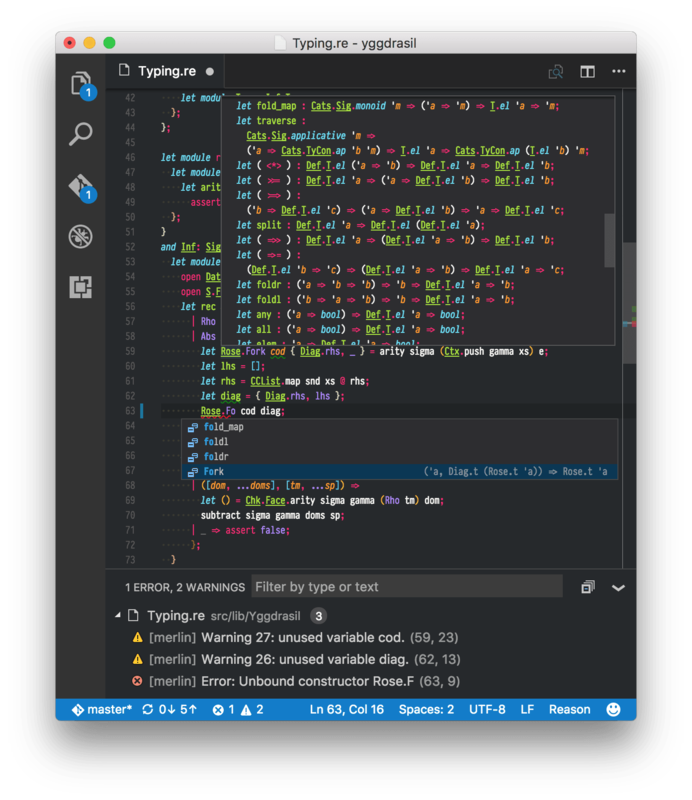 Visual Studio Code>Programming Languages>OCaml and Reason IDENew to Visual Studio Code? Get it now. There is an #editorsupport channel on the Reason discord server. If you would like to discuss an idea or need help or have other feedback you can usually find me (@freebroccolo) idling there. [x] built-in support for showing BuckleScript's bsb errors inline, as a companion to merlin's diagnosis. The Reason installation steps also installs Merlin for you, so you can skip the Merlin installation in the next section. Configured for you already if you've installed Reason above & plan to use it for JS compilation. Skip this step. This extension relies heavily on merlin so you will need to have your project set up for that in order to enable completion and hover info. See the Merlin wiki for details on how to do that. Basically you need to have a .merlin file in your project root which lists the source directories, libraries, and extensions used. Merlin's diagnosis is best-effort and can sometimes be wrong; bsb's diagnosis is 100% correct. bsb diagnosis also works on Windows. Note: due to an existing problem, make sure that you're opening vscode from the command-line, at the root of your project! Install this Visual Studio Code extension just like any other extension. Search for reason and install OCaml and Reason IDE by Darin Morrison. For the examples below, <cursor> represents the position of the current VS Code editor cursor. | [_, ..._] => failwith "<case>"
| [x, ...x<cursor>s] => failwith "<case>"
| [_] | [_, _, ..._] => failwith "<case>"